At Woodharbor, we want our cabinetry and millworks to reflect the qualities we respect most in a fine piece of furniture … simplicity, beauty, attention to detail, solid craftsmanship and purity of style and construction. We are determined to bring you the finest in interior wood millworks … and we are serious about that commitment. 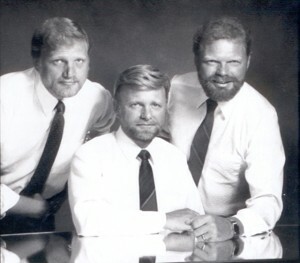 Woodharbor founders, brothers Curtis, Dennis, and Jon Lewerke started as custom home builders in the 1970’s. Unsatisfied with the quality of the cabinetry available to them, the brothers set out to manufacture their own cabinetry for the homes they built. In 1978 the brothers’ passion for creating high quality cabinetry led them to found Fieldstone Cabinetry, a company that soon garnered a national reputation for excellence in quality and design in the kitchen and bath cabinetry industry. In 1985, the brothers sold Fieldstone to Masco Corporation but continued at the helm of Fieldstone until they departed in October of 1993 to form a new company. With that new company, Woodharbor Doors & Cabinetry, Inc., the Lewerke brothers broke new ground by creating a ‘whole home concept’ for interior millworks – a complete line of interior millworks that complement and match each other in design, quality and finish. They coined the name ‘Woodharbor Home’ for this concept and made it the core of their entire production, marketing and sales philosophies. With the sale of the Woodharbor Door product lines to Trustile Doors of Denver, Colorado in February 2011, the company returned its focus to manufacturing kitchen, bath, and home cabinetry and related millwork with unparalleled quality and craftsmanship. Woodharbor manufactures four cabinetry product lines from a state-of-the-art facility located in Mason City, Iowa. Woodharbor Custom Framed and Woodharbor Custom Frameless Cabinetry, custom cabinetry lines and Breeze Framed Cabinetry by Woodharbor and Breeze Frameless Cabinetry by Woodharbor, a semi-custom cabinet line for the more value-conscious homeowner. All Woodharbor Cabinetry brands have 3/4″ thick dovetailed drawers, tandem undermount drawer slides, a premium catalyzed conversion varnish finish system and a variety of premium woods. Beautiful Designer Finishes, distinctive architectural details, and innovative accessories are available to design your one-of-a-kind custom kitchen.